Sixty Two Years of Serving Topsfield Boxford and surrounding towns. The building that Cargill Insurance is located in today has been a landmark since 1949 when Bill Cargill, Jr.'s dad built the office that houses Cargill Insurance today. After William R. Cargill, Sr. was discharged from World War II as a highly decorated pilot earning the Distinquised Flying Cross and Air Medal with 8 Oak leaf clusters with 65 missions over Europe he came home to help his mother with her Real Estate practice. 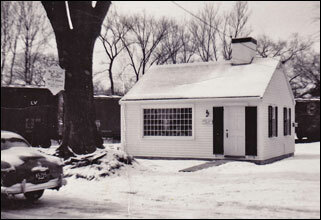 The 2 Main Street office was designed by Royal Berry Will's a well known architect in the area. He was known for his antique cape design with oversized chimney. Upon entering the office many vistors and clients are intriqued about the age of the building. Most guess that it was built in the late 1700's with old hand hewn beams and open fireplace hearth. William R. Cargill, Jr. feels that his office is his home away from home. With a large picture window in the front you can't miss much of the goings on around town. Topsfield is a great place to work and the downtown has the charm of a quintessential old New England Village. The pictures cited on this page are during construction phases that took place between the years of 1949 and 1953. The tree outside of the office was eventually cut down as the pigeons from the rail yard next door made too much of a mess and bothered customers as they walked by. 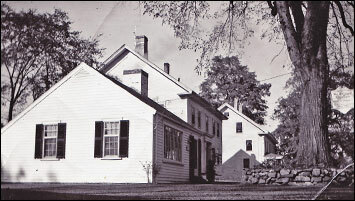 You will note the older homes looking down Main Street to the North are no longer. The Topsfield Post office is now the neighbor to Cargill Insurance. The photo above is a 1953 photo showing the back wing being added on which housed a law office for Thomas E. Cargill, Jr. William Cargill's brother. Our Founder, Bill Cargill, Sr.
William R. Cargill, Sr. established Cargill Real Estate after his service as a pilot in WWII. Having flown 65 missions over Europe in an A-20 and A-26 medium bomber he returned to the states. He was offered a senior captains position with Pan American Airlines flying internationally but Cargill at that time had his days in the sky. He opted for helping his mother with her Real Estate practice and decided to purchase a small plot of land in Topsfield Village and build the building that houses Cargill Insurance today. During World War II Cargill flew many missions most of them at low levels. Campaigns that he was involved with was D-Day and the Ardennes offensive. During both of the offensive's he flew many sorties and on one mission was shot down but was able to bring his crippled aircraft back to base for a belly landing. Despite 4 500 pound bombs tucked in the bomb bay, after three attempts Cargill brought his aircraft down without a scratch to his gunners. While Cargill was wounded by flak he refused the Purple Heart as he felt that was for more serious injuries. For this he was awarded the Distinguished Flying Cross. He carried the rank of 1st lieutenant and was going to be commissioned a Captain but the war ended. Cargill successfully ran Cargill Real Estate until his death in December 1958 at the age of 39. Bob Garrity a family relative is posed out front of the office. The building in the background is the current Vernon Martin Real Estate office. Garrity worked for the agency after the death of William R. Cargill, Sr. in 1958.